The Titanic was a luxury vessel and the largest moveable man-made object of its time. It sank on April 15, 1912 off the coast of Newfoundland in the North Atlantic. Over 1,500 of the 2,240 passengers and crew lost their lives in the disaster. It remains a cautionary tale of the arrogance of builders than their creation could ever be flawless or impervious to harm. 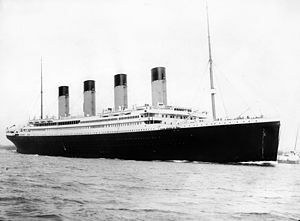 Scroll down to read more about the Titanic, its construction, crew, passengers, theories of its sinking, and its legacy. 29th July 1908 The design for the Titanic was approved. 10th April 1912 9:30-11:30 a.m. Passengers arrived in Southampton and began boarding the ship. 10th April 1912 Noon The Titanic set sail and began her maiden voyage. 12th, 13th April 1912 The Titanic sailed through calm waters. 14th April 1912 11:40 p.m. Lookout Frederick Fleet spotted an iceberg dead ahead. The iceberg struck the Titanic on the starboard (right) side of her bow. 15th April 1912 12:00 a.m. The captain was told the ship can only stay afloat for a couple of hours. He gave the order to call for help over the radio. 15th April 1912 12:05 a.m. The orders was given to uncover the lifeboats and to get passengers and crew ready on deck. There was only room in the lifeboats for half of the estimated 2,227 on board. 15th April 1912 12:25 a.m. The lifeboats began being loaded with women and children first. 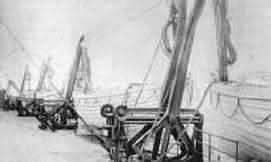 The Carpathia, southeast of the Titanic by about 58 miles, picked up the distress call and began sailing to rescue passengers. 15th April 1912 12:45 a.m. The first lifeboat was safely lowered away. Although it could carry 65 people, it left with only 28 on board. The first distress rocket was fired. Eight rockets were fired the whole night. 15th April 1912 2:05 a.m. The last lifeboat left the ship. There were now over 1,500 people left on the ship. The tilt of Titanic’s deck grew steeper and steeper. 15th April 1912 2:20 a.m. The Titanic’s broken off stern settled back into the water, becoming more level for a few moments. Slowly it filled with water and tilted its end high into the air before sinking into the sea. People in the water slowly froze to death. 15th April 1912 4:10 a.m. The first lifeboat was picked up by the Carpathia. 18th April 1912 9:00 p.m. The Carpathia arrived in New York. 22nd April to 15th May Several ships were sent to the disaster site to recover bodies. A total of 328 bodies were found floating in the area. The White Star Shipping Line was founded in 1850 to take advantage of an increase in trade following the discovery of gold in Australia. In 1867, the White Star Shipping Line was purchased by Thomas Ismay and set up to rival Cunard in Trans-Atlantic passenger traffic. Thomas’s son, Bruce, became a partner in the firm and took over as company director in 1899 when his father died. In 1902 the company was bought by wealthy American, J Pierpoint Morgan. Ismay retained his position within the firm as managing director. Morgan’s money meant that the company could build large luxury liners to attract the wealthy passengers. In 1907 Ismay suggested that the company build two liners which were heavier, bigger and more luxurious than any other ship in the World. They were to be called Olympic and Titanic. If these were successful a third, Gigantic, later renamed Brittanic, would follow. The Titanic construction took place in Belfast by the shipbuilding company Harland and Wolff. The company was owned by Lord Pirrie, a friend of Bruce Ismay, managing director of the White Star Line (pictured below, left). The chief designer of the Titanic was his son-in-law, Thomas Andrews. 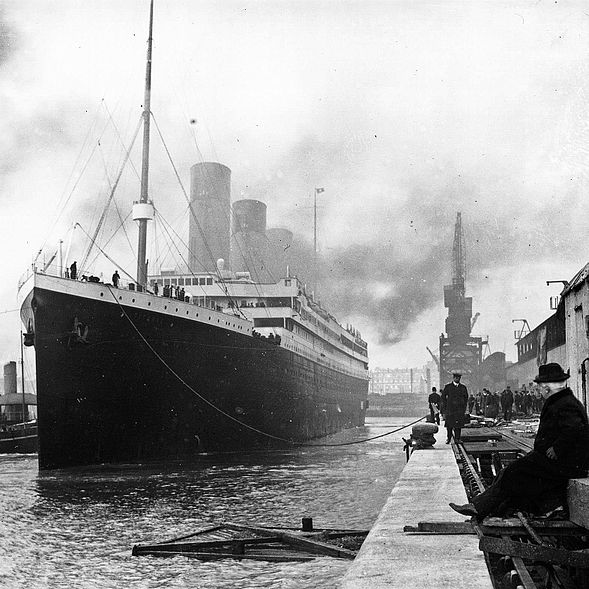 Construction of the Titanic began in 1909. 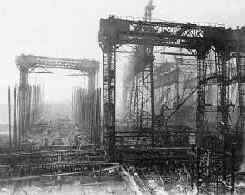 Harland and Wolff had to make alterations to their shipyard (larger piers and gantries) to accommodate the giant liners, Titanic and her sister ship Olympic. The two ships were to be built side-by-side. Titanic was constructed with sixteen watertight compartments. Each compartment had doors that were designed to close automatically if the water level rose above a certain height. The doors could also be electronically closed from the bridge. Titanic was able to stay afloat if any two compartments or the first four became flooded. Shortly after Titanic hit the iceberg it was revealed that the first six compartments were flooded. There were twenty-four double ended boilers and five single ended boilers which were housed in six boiler rooms. The double ended boilers were 20 feet long, had a diameter of 15 feet 9 inches and contained six coal burning furnaces. The single ended boilers were 11 feet 9 inches long with the same diameter and three furnaces. Smoke and waste gasses were expelled through three funnels. Titanic’s four funnels were constructed away from the site and were then transported to the shipyard for putting on the Titanic. Only three of the funnels were used to expel smoke and waste gasses. The fourth was added to make the ship look more powerful. Titanic had three propellers which were powered by steam. The rotation of the propellers powered the ship through the sea. Titanic was launched in 1911. The next ten months were spent completing the interior of the ship. Details and pictures of the interior can be viewed on the layout page of this site. The total cost of the RMS Titanic was $7.5 million (1912). The Crow’s nest was used by the ship’s lookouts. It was from here, at 11.40 pm on April 15 1912, that lookouts Frederick Fleet and Reginald Lee first spotted the iceberg that caused the Titanic to sink. The Titanic’s officer quarters were located just below the boat deck so that they could quickly reach the bridge in case of emergency. Captain Smith retired to the officers’ quarters about an hour before the ship hit the iceberg. The Bridge was the place where the ship was operated from. There was always a senior officer on the bridge and it was first officer Murdock who ordered the Titanic ‘hard a starboard’ when the iceberg was spotted. The two first class staircases were very grand indeed. Over the top of both were glass domes which allowed sunlight to pass through. 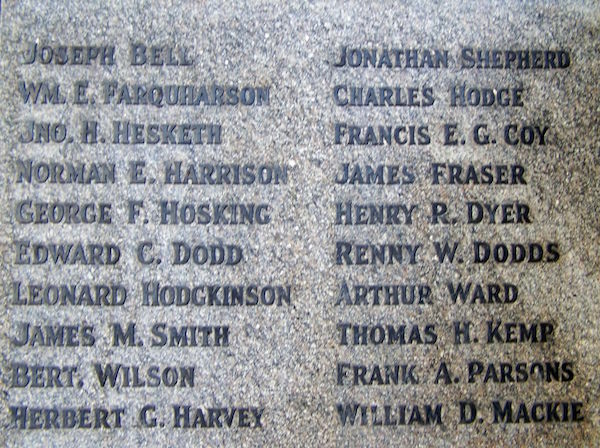 The two wireless operators, Harold Bride and John Philips were employed to send telegrams on behalf of the passengers. They also received and sent messages to other ships. It was here that the messages warning of icebergs were received on the afternoon of 14th April 1912 and the SOS messages were sent when it was realised that the Titanic would sink. The Titanic’s gymnasium had all the latest exercise equipment – a bicycle, rowing machine and electric horse. Separate sessions were available for men, women and children. The first class staterooms were luxuriously furnished with curtained beds and tables and chairs. The most expensive even had their own private balcony. The Titanic’s a la carte restaurant served the finest food. Passengers could reserve tables and book areas for private parties. The First Class smoking room was open for most of the day. Passengers could purchase the most luxurious cigarettes and tobacco here. This cafe was designed to look like a Paris street cafe and the waiters were French. 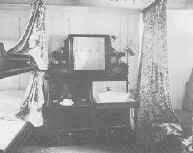 This was one of the leisure rooms provided for the use of third class passengers. 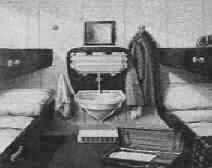 Second class staterooms were occupied by up to four people. By the standards of the day they were luxurious with mahogany furniture and linoleum floors. In order to ensure that food served at tables was as fresh as possible, the Titanic was fitted with a refrigerated storage area. There were different areas for meat, cheese, flowers and wines and champagne. This large, pleasantly furnished room was where second class passengers took their meals. Food served to second class passengers was cooked in the first class kitchen. Food for both first and second class passengers was prepared in the same galley. There was a large ice-cream maker as well as refrigerated rooms for storing meat and perishable goods. The First Class Dining room was beautifully decorated with a huge glass dome roof and could seat over 500 people. This was where the third class passengers took their meals. 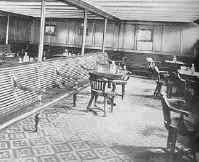 It was said to be like second class dining rooms on other ships. The Titanic had 24 boilers each containing 6 furnaces and 5 boilers containing 3 furnaces. Coal was burned in the boilers to power the ship and the steam and smoke was released through the four funnels. Bruce Ismay, of the White Star Line, hoped that the Titanic would make the fastest ever crossing from Southampton to New York. First class passengers met in the first class reception room. They would often enjoy a cocktail together before going into dinner. The Titanic’s turkish baths was one of the most luxurious to be found in Europe. The Titanic’s four electric lifts were one of the new features that made the Titanic special. Designed for use by first and second class passengers only, they each had their own lift attendant. None of the four lift attendants survived. The Titanic was on of the first ships to have a swimming pool on board. It was filled with sea water which was heated by the boilers. There were separate times for men and women. As part of it’s recreational facilities for passengers, the Titanic had a full-size squash court. Because the squash court was located just below the bridge but above the watertight compartments, it was used by the ship’s officers to monitor the rise of the water. The Titanic had a fully equipped post office staffed by five mail clerks. Over three thousand mail bags were lost when the ship sank and over 7 million items of mail never reached their destination. 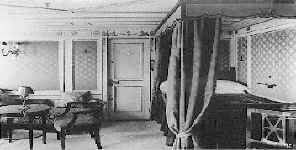 Third Class berths on the Titanic were used by up to eight people. As you can see in the picture above, they slept in bunks and used a communal sink. This was the passage between the boilers that was used by the firemen. In the film, Rose and Jack run through the fireman’s passage to the cargo room. However, on the Titanic the fireman’s passage was on the deck below the cargo room. The Titanic had a crew of some 890 men and women of whom only 212 were saved. 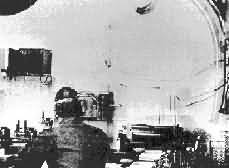 The crew’s quarters were located at the rear of the ship on decks D, E and F.
This was a lifting device to enable large objects to be lifted onto ships. In the film Titanic, a cargo crane is seen lifting crates and a car onto the ship. Deck Crew – Officers, Masters at arms, Storemasters and able bodied seamen. Engineering Department – Engineers, Boilermen, Firemen and Electricians. Victualling Department – Stewards and Galley staff. The maiden voyage of the Titanic was to be 62-year-old Captain Smith’s last voyage before he retired. Smith was married with a young daughter. Very little is known about his actions on the Titanic after the collision – he was last seen on the bridge of the sinking ship. Captain Smith went down with his ship and his body was never recovered. Henry Wilde was serving as Chief Officer on the Olympic but was transferred to the Titanic for her maiden voyage. Wilde was off duty when the ship hit the iceberg. He took control of the even numbered lifeboats and was last seen trying to free the collapsible lifeboats. Wilde’s body has never been recovered. William Murdoch, 39 years old, had served on a number of White Star ships. He joined the Titanic as first officer and was on the bridge at the time of the collision and gave the order to turn the ship. He helped to load women and children into the lifeboats. He did not survive the disaster and his body was not recovered. Charles Lightoller had begun his sailing career at the age of 13 and had been involved in a shipwreck before. Lightoller was keen to load the lifeboats as quickly as possible and was still trying to free the collapsible lifeboats when Titanic sank. He was sucked under the sea but blown to the surface by air escaping from a vent. He managed to climb onto the overturned collapsible lifeboat B. He survived the disaster and as the most senior surviving officer testified at both inquiries. Herbert Pitman was in his bunk when Titanic hit the iceberg. After helping to uncover lifeboats he was put in charge of lifeboat number 5 by William Murdoch. After Titanic had sunk, Pitman wanted to return for more passengers but others in the boat persuaded him that they would swamp the boat and they would all die. Pitman was called to give evidence during the inquiry into the disaster. Joseph Boxall, aged 28, had been at sea for 13 years. After the collision Boxall helped to fire the distress rockets and to signal the nearby ship with a morse code lamp. Boxall was put in charge of lifeboat number 2 and like Pitman was persuaded not to return for more survivors after the ship had sunk. Boxall also gave evidence at the inquiry. Lowe was fast asleep when the Titanic hit the iceberg. When he eventually woke up, disturbed by noise, the ship was already at an angle. Lowe helped to load women and children into the lifeboats and took charge of lifeboat 14. After the cries and screams from the water had died down, Lowe put passengers from his lifeboat into others nearby before returning to pick up survivors. Lowe only found 4 people alive and one died before being rescued by the Carpathia. Lowe gave evidence at the inquiry. James Moody was on duty at the time of the collision and took the phone call from Frederick Fleet warning of the iceberg. He helped to load the lifeboats and was last seen trying to launch the collapsible lifeboats. Moody did not survive the disaster. After the collision Joughin fortified himself with a quantity of alcohol before throwing deckchairs into the ocean for people to hold on to. As the ship neared its final moments Joughin climbed over the stern rails and ‘rode’ the ship into the ocean. He managed to reach collapsible B and because there was no more room to climb on, spent several hours in the freezing water. Joughin survived and was rescued by the Carpathia. Frederick Fleet and Reginald Lee were on duty in the crow’s nest and were the first to sight the iceberg. Fleet radioed the information to the bridge. Fleet survived in lifeboat 6, Lee in lifeboat 13. Both men were called to give evidence at the inquiry. The two radio operators’ main duty was the sending of private telegrams for passengers. However, they also received seven iceberg warnings from other ships on the 14th of April. After the collision they were asked to send the distress signal CQD (Come Quick Disaster). The signal was changed to the new distress code SOS. After contacting the Carpathia both operators stayed at their post until water poured into the Marconi room. Bride survived by climbing onto the overturned hull of collapsible B. Phillips also reached collapsible B but died sometime before dawn. There were two bands on the Titanic. After the collision they grouped on the deck and played to keep the spirits of the passengers up. Some survivors state that the band played until the end and many claim that the hymn ‘Nearer my God to thee’ was the last song played. None of the bandsmen survived. 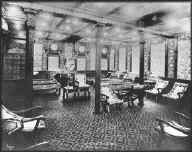 The Titanic second class passengers enjoyed a level of luxury that rivaled that of first class on other liners. Titanic was also the first ship to have an electric elevator for second-class passengers. The following passengers are the most well known second-class travelers. Lawrence Beesley was a public school teacher traveling to America for a holiday. He survived the disaster in lifeboat 17 and was one of the first people to publish an account of the sinking and rescue. Seven year old Eva Hart was travelling to America with her parents. Eva’s mother had a premonition and refused to sleep at night during the voyage. Eva and her mother were saved in lifeboat 14. Eva never saw her father again. These two men were Roman Catholic priests who conducted services for second class passengers. After the sinking they both helped other passengers to safety, heard confessions and prayed. Both died in the tragedy. Charles Aldworth was first class passenger, William Carter’s chauffeur. Carter’s Renault 25 motor car was stored in the cargo hold. 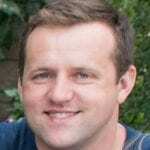 Charles Aldworth did not survive. 118 second class passengers survived the disaster – 14 men, 80 women and 24 children. There were 706 third class passengers on board – 462 men, 165 women and 79 children. 178 third class passengers survived the disaster – 75 men, 76 women and 27 children. The sinking of the ‘unsinkable’ Titanic shattered much confidence in science and made people more skeptical about such fantastic claims. Numerous theories have coalesced over the years, and they each have their defenders. Some are more plausible than others, but they each have a shred of plausibility due to the complexity of maritime navigation in the North Atlantic, and steering a massive, untested ship. But why did the largest, most advanced ship of the century sink?Below are theories on why the Titanic sunk. This was Captain E. J. Smith’s retirement trip. All he had to do was get to New York in record time. Captain E. J. Smith said years before the Titanic’s voyage, “I cannot imagine any condition which would cause a ship to founder. Modern shipbuilding has gone beyond that.” Captain Smith ignored seven iceberg warnings from his crew and other ships. If he had called for the ship to slow down then maybe the Titanic disaster would not have happened. About three million rivets were used to hold the sections of the Titanic together. Some rivets have been recovered from the wreck and analysed. The findings show that they were made of sub-standard iron. When the ship hit the iceberg, the force of the impact caused the heads of the rivets to break and the sections of the Titanic to come apart. If good quality iron rivets had been used the sections may have stayed together and the ship may not have sunk. Bruce Ismay was the Managing Director of the White Star Line and he was aboard the Titanic. Competition for Atlantic passengers was fierce and the White Star Line wanted to show that they could make a six-day crossing. To meet this schedule the Titanic could not afford to slow down. It is believed that Ismay put pressure on Captain Smith to maintain the speed of the ship. The belief that the ship was unsinkable was, in part, due to the fact that the Titanic had sixteen watertight compartments. However, the compartments did not reach as high as they should have done. The White Star Line did not want them to go all the way up because this would have reduced living space in first class. If Mr Andrews, the ship’s architect, had insisted on making them the correct height then maybe the Titanic would not have sunk. The final iceberg warning sent to Titanic was from the Californian. Captained by Stanley Lord, she had stopped for the night about 19 miles north of Titanic. At around 11.15, Californian’s radio operator turned off the radio and went to bed. Sometime after midnight the crew on watch reported seeing rockets being fired into the sky from a big liner. Captain Lord was informed but it was concluded that the ship was having a party. No action was taken by the Californian. If the Californian had turned on the radio she would have heard the distress messages from Titanic and would have been able to reach the ship in time to save all passengers. Both America and Britain held inquiries into the disaster. both reached the almost identical conclusions. The American inquiry concluded that Captain Smith should have slowed the speed of the boat given the icy weather conditions. The British inquiry, on the other hand, concluded that maintaining speed in icy weather conditions was common practice. Both inquiries agreed on who was most at fault – Captain Stanley Lord of the Californian. 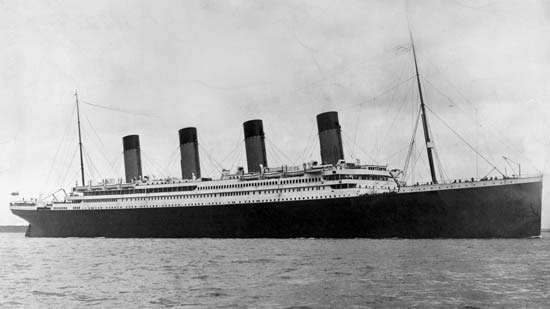 The inquiries stated that if Lord had gone to Titanic’s assistance when the first rocket was seen then everyone would have been saved. All ships must carry sufficient lifeboats for the number of passengers on board. Ship radios should be manned 24 hours a day. Regular lifeboat drills should be held. Speed should be reduced in ice, fog or any other areas of possible danger. One of the factors that makes the sinking of the Titanic so memorable is the fact that lives were needlessly lost. There were not enough Titanic lifeboats on board to hold all the passengers and crew, and when the lifeboats were launched they were not filled to capacity. The information on this page represents some of the main facts relating to the lifeboats on board Titanic. Due to advancements that had been made in ship building it was not necessary for boats to carry more lifeboats. The latest boats were stronger than ever and had watertight compartments making them unlikely to require lifeboats at all. Sea routes used were well-travelled meaning that the likelihood of a collision was minimal. The latest boats were fitted with wireless technology. That it would be impossible for crew members to be able to load more than sixteen boats in the event of a disaster. That the provision of lifeboats should be a matter for the ship owners to consider. The Titanic carried 20 lifeboats, enough for 1178 people. The existing Board of Trade required a passenger ship to provide lifeboat capacity for 1060 people. Titanic’s lifeboats were situated on the top deck. The boat was designed to carry 32 lifeboats but this number was reduced to 20 because it was felt that the deck would be too cluttered. At the British investigation, Charles Lightoller as the senior surviving officer was questioned about the fact that the lifeboats were not filled to capacity. They had been tested n Belfast on 25th March 1912 and each boat had carried seventy men safely. When questioned about the filling of lifeboat number six, Lightoller testified that the boat was filled with as many people as he considered to be safe. 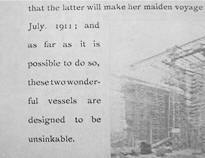 Lightoller believed that it would be impossible to fill the boats to capacity before lowering them to sea without the mechanism that held them collapsing. He was questioned as to whether he had arranged for more people to be put into the boats once it was afloat. Lightoller admitted that he should have made some arrangement for the boats to be filled once they were afloat. When asked if the crew member in charge of lifeboat number six was told to return to pick up survivors, the inquiry was told that the crew member was told to stay close to the ship. (questions 13883 – 13910) Lifeboat number 6 was designed to hold 65 people. It left with 40. Titanic also carried 3500 lifebelts and 48 life rings; Useless in the icy water. The majority of passengers that went into the sea did not drown, but froze to death. Many people were confused about where they should go after the order to launch the lifeboats had been given. There should have been a lifeboat drill on 14th April, but the Captain cancelled it to allow people to go to church. The inquiry was concerned that there was a delay of more than an hour between the time of impact and the launching of the first lifeboat – number 7. As a result there was not enough time to successfully launch all the Titanic lifeboats. Collapsible lifeboats A and B were not launched but floated away as the water washed over the ship. Collapsible B floated away upside down. People tried unsuccessfully to right it. 30 people survived the disaster by standing on the upturned boat. So near but yet so far away…. The Titanic was not the only ship in the North Atlantic ice field on the night of 14th April 1912. At around 10.30pm the liner Californian had stopped at the edge of the ice field for the night. They had turned off their radio and the operator had gone to bed. The night crew of the Californian noticed a big passenger liner stop some six miles to the south at 11.40pm. Shortly after midnight the Captain of the Californian was told by his crew that the big passenger liner was firing rockets into the sky. They concluded that the ship had stopped for the night and was having a party. At 2.20am it was noticed that the big ship had disappeared and the crew believed that it had steamed away. 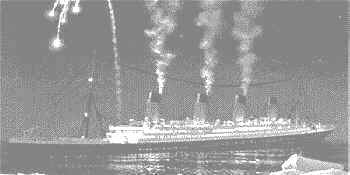 At 3.20am more rockets were seen and by 4.00am another ship, the Carpathia, could be clearly seen in the last noted position of the big liner. The Californian’s wireless operator was awoken at around 5am and the crew learned of the fate of the Titanic. In the British and American inquiries into the disaster, Captain Stanley Lord of the Californian maintained that his ship was positioned nineteen miles north of the Titanic not six and could not have reached the Titanic in time to rescue passengers. However, many of Titanic’s survivors testified that there was indeed another ship about six miles north of Titanic. The inquiries concluded that the Californian had indeed been just six miles to the north of Titanic and could have reached the Titanic before it sank. By now the story of the sinking of the Titanic is well-known and well-worn: Man creates an “unsinkable ship” and, in his hubris, brings along too few lifeboats. An iceberg cures his of his arrogance by tearing a hole in the side of the ship, sending it and thousands of passengers to the icy depths of the North Atlantic. But according to a new documentary, the iceberg may not have been the sole reason for the sinking of the Titanic. Instead, in an extraordinarily stroke of bad luck, the iceberg may have struck in the exact spot where the hull had been weakened by a coal fire that blazed in the depths of the ship prior to disembarking. Irish journalist Senan Molony argues in his January 2017 documentary “Titanic: The New Evidence” the hull of the ship was compromised weeks before its ill-fated voyage. He examined photos and eye-witness testimonies to determine that a fire spontaneously lit inside one of Titanic‘s coal bunkers and severely weakened a segment of the ship’s hull. “The ship is a single-skin ship,” Molony told Smithsonian.com. He means that while modern ships contain two hulls, Titanic, like other early twentieth-century vessels, had only one. Such a structure typically made for a weaker vessel, but in the Titanic‘s case it proved fatal. The bunkers where the crew stored engine coal was located next to the hull. The heat from the fire transferred directly to the ship’s metal structure. The ah-ha moment for Molony came when he discovered a trove of previously unknown photographs. Four years ago he purchased them from a descendant of the engineering chief of Harland and Wolff, the Irish company that built the Titanic. He was startled to see a thirty-foot-long black streak documented on the outside of the ships hull, near where the iceberg struck its blow. When Molony asked naval architects what the streak in the photograph could be, nobody knew but everyone was intrigued. “The best suggestion at the time was that this was a reflection.” But when the photograph was taken, there was no road or dock on the shore that could have been reflected in the hull. Other engineers believed the streak to have been caused by a fire in one of Titanic‘s three-story-tall coal bunkers. Molony assembled the facts in his own timeline in order to create a new narrative. He argues that the fire began as early as three weeks before the Titanic launched its voyage but was ignored due to pressure to keep the ship on schedule and fears of bad press. Britain ruled the seas but was facing increased pressure from Germany and others for the valuable immigrant trade. Every stoker who was interviewed declared that the Titanic was afire from the time she left Southampton until Saturday afternoon at 2 o’clock. This story was first told by an officer of the ship, who requested that his name be withheld, saying that all the men had been warned not to talk about the disaster. This account was one of the first explanations of the Titanic‘s sinking; it was mentioned by British officials in their official inquiry in 1912. But the narrative was downplayed by the judge who oversaw it, Molony said. Molony’s theory is plausible, but not everyone buys it. Denying the iceberg explanation, after all, puts him in odd company. A number of Titanic “truthers” have emerged over the decades, offering less-than-convincing explanations, such as a torpedo from a German U-boat sinking the ship. Others, as Dan Bilefsky of the New York Times notes, blame the sinking on an Egyptian mummy’s curse. The conventional wisdom still holds that the iceberg is the main culprit. “A fire may have accelerated this. But in my view, the Titanic would have sunk anyway,” Dave Hill, a former honorary secretary of the British Titanic Society, told Bilefsky. Molony believes that his version holds up due to the shakiness of the original inquiry’s findings. The same inquiry stated that the Titanic had sunk intact, while it was found later to be broken in half on the sea floor. “Just because an official finding says it doesn’t make it true,” Molony says. To read more about “Titanic: The New Evidence,” click here. You may have seen James Cameron’s theatrical version of the Titanic, a movie that has accrued over $1.84 billion in total gross sales since its release in 1997. But we can confidently bet that you have never laid eyes on Saved From the Titanic, a 1912 silent motion picture starring actress and survivor of the RMS titanic, Dorothy Gibson. Ms. Gibson was one of the 28 people that safely made it out in the first lifeboat launched from the sinking ship, which floated around aimlessly for 5 hours until it was rescued. When she landed in New York, she co-wrote the script and played a fictional role of herself in the film. The plot involves her retelling the story of the incident to her family, with occasional flashbacks depicting what took place. The entire movie was filmed in a New Jersey studio, and aboard a ship in the New York Harbor. It was the first film in history to tell a story about the disaster, and was released just 29 days after it happened. Unfortunately, the movie is considered a lost film, as the only existing prints were destroyed in a fire in 1914. The Titanic vessel took 3 years to build and cost about $7.5 million. If we take inflation into account, then that would be roughly equivalent to $174 million in today’s dollars. 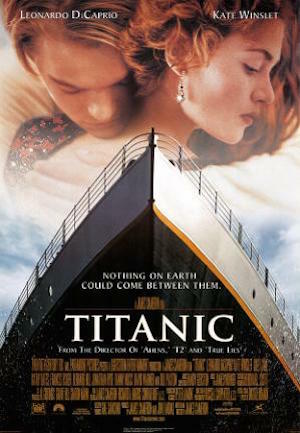 The 1997 movie cost $200 million to film, which is way more than the Titanic itself. 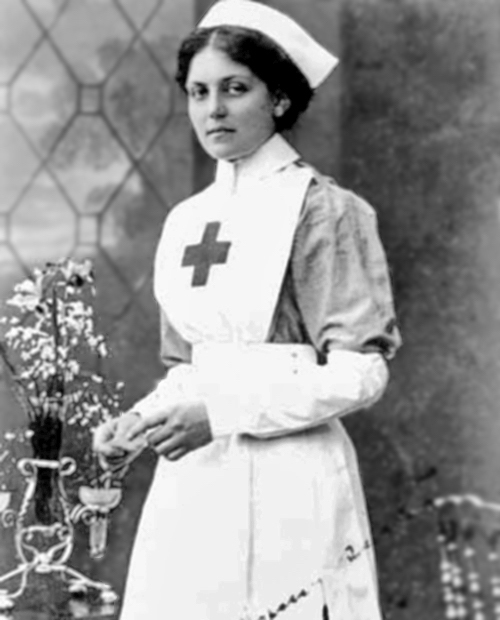 Violet Constance Jessop may be the bravest ocean liner stewardess/nurse in history. Not only did she survive the unfortunate sinking of the RMS Titanic, but she also survived the sinking of her sister ship HMHS Britannic. Additionally, she was also onboard the RMS Olympic, their other sister ship, when it struck a protected cruiser. After the war, she continued to work for different ship lines. Years after she retired, Violet claims to have received a call from a woman who asked if she had saved a baby on the night of the Titanic. Violet replied, “yes,” and the woman replied with, “I was that baby.” The person then hung up. Violet claims to never have told anyone that story before the call. Ms. Jessop, who was often referred to as, “Ms. Unsinkable,” died of heart failure in 1971 at the age of 84. When the order came to “abandon ship,” it was far too late for the engineers aboard the Titanic to escape. They could not make their way through the confusing passageways deep in the heart of the Titanic, and many of them most likely did not try. They probably did not drown, but were instead crushed by the boilers and machinery that broke when the vessel sank deeper. They died carrying out their duty, and sacrificed themselves so that others would have a chance at surviving. 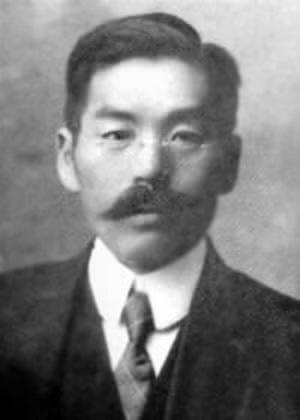 Masabumi Hosono was the only Japanese passenger aboard the Titanic to survive the disaster. When he arrived in Japan, he was condemned by the public for his decision to save himself rather then go down with the vessel. As a result, he lost his job, but was soon re-employed and continued to work until 1939. To be fair, a lot of the men that survived the Titanic were frowned upon, because they were supposed to let women and children on the lifeboats first. However, Mr. Hosomo was the only survivor who reportedly lost his job as a result. 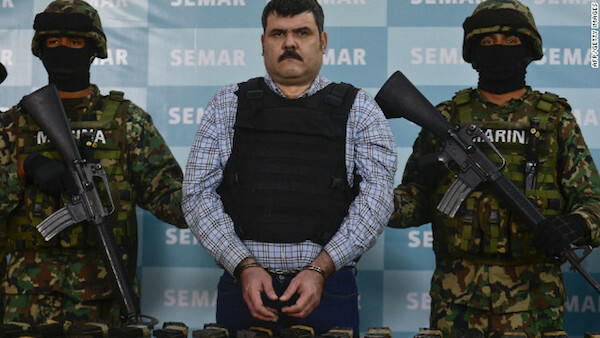 When the feds captured Gulf Cartel Leader, Jorge Eduardo, they found a lot of expensive jewellery in his mansion, but nothing was as rare as the two watches made from the original metal of the Titanic ship. 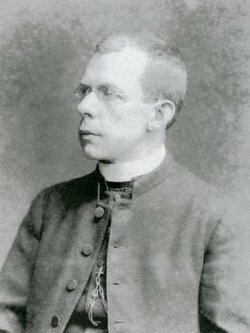 An English Catholic priest named Thomas Roussel Davis Byles remained on board the Titanic as it was sinking, listening to confessions and giving absolution. He was portrayed in the 1997 film by actor James Lancaster. The “Titan”: A Prophesy of the Titanic Sinking? Because Titan was considered unsinkable she only carried the minimum number of lifeboats required by law – 24 – able to carry 500 people. This was not enough for the 2000 passengers on board. Morgan Robertson’s Titan hit an iceberg in the North Atlantic Ocean and sank. 2987 people died in the disaster. Morgan Robertson republished Futility after the sinking of the Titanic with some notable changes suggesting that he was trying to cash in on the Titanic disaster. Did the book predict the Titanic disaster?Uncanny, but true!